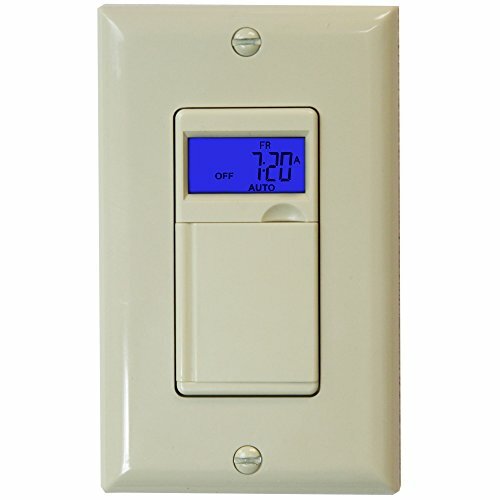 AUTOMATIC LIGHT SWITCH TIMER Automatically turn lights, lamps, fans, sprinklers, and motors ON/OFF at the times and days you program the programmable timer switch for safety and security. PROGRAMMABLE TIMER 18 unique ON/OFF settings, 7-day programming. Two modes: Manual (Normal ON/OFF switch) Automatic (Controls Load according to program). WALL TIMER SWITCH Replaces a standard switch utilizing current wiring in the junction box. Ni-MH battery will store time/program settings in case of power outage. EASY PROGRAMMING Quick and easy programming allows you to schedule both work days and weekends grouped, or schedule for every day. Anti-theft, adds security to your home. NEUTRAL WIRE REQUIRED. Resistive 1800W, Motor 1/2HP, Voltage 120VAC, 15Amps, Single pole only. Not for 3-way use. Wall plate included (8831-W).